This tastefully decorated casita is in the heart of the South Capitol District. You are an easy walk to the Rail Yard District and a hop, skip, and jump to the plaza! 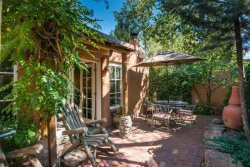 You'll enjoy peace and quiet at this beautiful retreat with a private patio. You can also store your suitcases, skis, or anything else in the locking storage shed. Also included is Cable TV, high-speed Wifi Internet, use of an onsite washer/dryer, and a reserved parking space! We also provide linens, towels, blankets, and snacks! This tastefully decorated one bedroom casita is in the heart of the South Capitol District. You are an easy walk to the Rail Yard District and a hop, skip, and jump to the plaza! You'll enjoy peace and quiet at this beautiful retreat with a private patio. You can also store your suitcases, skis, or anything else in the locking storage shed. Also included is Cable TV, high speed Wifi Internet, use of an onsite washer and dryer, and a reserve off-street parking space! We also provide linens, towels, blankets, and snacks! Book today! You will have access to the entire condo and the outdoor patio space. You will also be able to utilize the storage locker in the courtyard! I'm only a phone call away and will be available as needed by guests! Some spaces are shared - Washer and dryer are shared items. They are in a separate room.